Easier breathing and cool comfort are what you get when you wear an AirWave respirator. The larger surface area of the patented wave design means more air flows in and out of the mask. Easy breathing… by design. The unique FlexFit design moves with your mouth for comfort all day long. 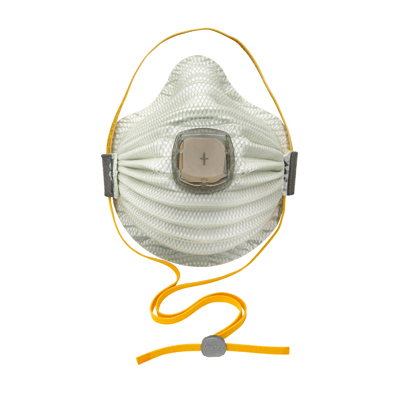 More comfort means AirWave is a mask that your workers will want to wear, and that means more compliance. Plus the Dura-Mesh shell prevents collapsing from heat and humidity so your mask lasts longer. When you can breath easier and you’re more comfortable, you’ll want to keep wearing AirWave! Longer wear means less masks, less masks means more savings. Compliance and cost savings just got easier. SmartStrap is ADJUSTABLE and HANGABLE allowing the AirWave to hang from the neck when not in use so it does not get thrown away and you use fewer masks. Plus its adjustable soft cloth strap feels cool and comfortable. Say goodbye to waste, hello to cost-savings! 99.97% efficient against non-oil based particulates. Use in environments where an OSHA substance specific standard applies (lead, cadmium, arsenic, MDA) as well as pharmaceutical manufacturing, conventional and nuclear power generation, welding, cutting and metal pouring. Environments where an OSHA substance specific standard applies (lead, cadmium, arsenic, MDA) as well as pharmaceutical manufacturing, conventional and nuclear power generation, welding, cutting and metal pouring. No oils present. Note: For areas with oils present, you must use an R or P respirator. Call our Technical Support Department for more details.